They resemble pike, but longnose gars are thin and have a needle-like jaw set. On their skin they have scales resembling enameled armor. Longnose gars are distinguished from other gars in that the jaws are twice as long as the head. The body is greenish with dark gray irregular blotches. The maximum length is about 6 feet, and weight can go up to about 20 lbs. This is an aggressive fish that tends to stalk or ambush relatively smaller fish prey. They are not choosy, and will take whatever comes within reach. They prefer water that is clear, and not turbid. Besides having normal gills, these fish also have a swim bladder used to store oxygen, for use in poorly-oxygenated water. The greatest problem for the gar has been the changes in water flow, the construction of dams, and pollution or turbidity increases. The range of the longnose gar is in river systems from Texas to Minnesota, east to the Appalachians. Also St. Lawrence River, and coast of Delaware to Florida. Longnose gar inhabit fresh and brackish waters of rivers and coastal inlets. The longnose gar is an aggressive fish that tends to stalk or ambush relatively smaller fish prey. They are not choosy, and will take whatever comes within reach. They prefer water that is clear, and not turbid. 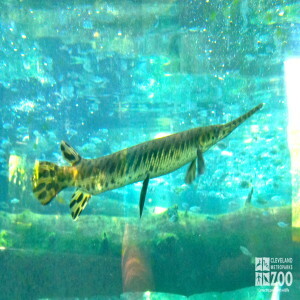 Breeding of longnose gar may occur between March and August, depending on geographic location, in fresh water. They spawn in slow-moving water near riffles and where vegetation is present. The water depth is usually between 10" and 20" where riffles have deposited a good substrate of gravel and boulders. These stones and vegetation hold the spawn. The milt and roe of the gar are poisonous. Young gar eat invertebrates. Adults eat mainly fish and crabs.